Virus-Busting Chips! Why Intel Paid Billions for McAfee. The news of Intel's very expensive McAfee purchase raises one obvious question: why is security software worth over $7 billion to a chip maker? 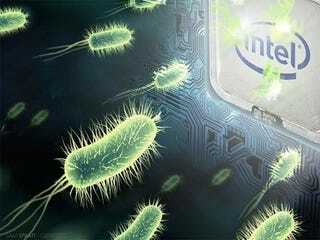 Intel has been short on specifics, but it's becoming clear that virus-killing silicon is coming. Computer security with hardware roots isn't new for Intel, but it's stuck in last-gen tech that can't stop your system from getting smoked. Feature sets that can help filter out malicious network traffic or let CPUs screen for certain worms have been safeguarding computers you've already thrown away by now. But they're limited. Right now, most of the anti-malware grunt work is being handled by software. Letting applications do the heavy lifting is a resource-heavy affair, which makes chipmakers like Intel nervous when they look forward and see the future of computing floating in the cloud. The problem with security in the cloud is twofold. To begin with, netbooks and tablets usually just don't have the muscle to balance intensive malware efforts. Do you think your anemic netbook can root out marauding trojans, scanning hundreds of thousands of files, as well as your desktop? But what about just putting the security software in the cloud too? This leads to a second objection: do we really want our sensitive stuff floating out of our devices? Will people feel comfortable having their secrets scanned remotely? Intel doesn't think so—and says it has a solution. When we interviewed Intel's head tech honcho, CTO Justin Rattner in June, he had much to say about the intersection of cloud computing and secure computing. And the future of beating viruses, according to Intel, lies in the chips that drive our devices, not some program running in the background. "As silicon developers," Rattner explained, "we have a requirement to provide truly secure capability when it's needed." This means malware-fighting hardware is a new mandate. Rattner asserts that their hardware ambitions are to "protect those systems from the various forms of malware and then, in addition, giving them the ability to keep their secrets no matter what happens." Which sounds a little abstract, right? But put it in context: Rattner's plan sounds pretty real as of right now. While discussing the news of their acquisition today, Intel minced no words about where their pricey new subsidiary will take them. McAfee technology will be put on Intel silicon. Virus scanning, trojan hunting, buffer overflow-blocking—all beat back before it has a chance to touch your software. McAfee's line of applications will continue to sell as is, but Intel simply doesn't believe that the future of computer security can be done with software alone. Malware keeps getting meaner. To block viruses, you need to hit them as soon as possible, which means as deep into the hardware as possible. Think of it as the difference between swatting flies in your kitchen and just keeping your windows closed in the first place. Intel's processors won't change for now, but when we asked them about the deal's implications for architecture changes down the line, they confirmed that the era of an antivirus-on-a-chip lies ahead—with a mysterious new hardware product slated for 2011. Thanks to Moore's Law, Intel will have more real estate to fill with security mechanisms—courtesy of McAfee's R&D labs. Whether secure silicon takes the form of hardware acceleration for virus-sniffing heuristics, or something else entirely, remains to be seen. But if Intel makes good on its promises (and on the nearly $8 billion it forked over), that folder of photos you regret will stay safe without having to climb to the cloud.